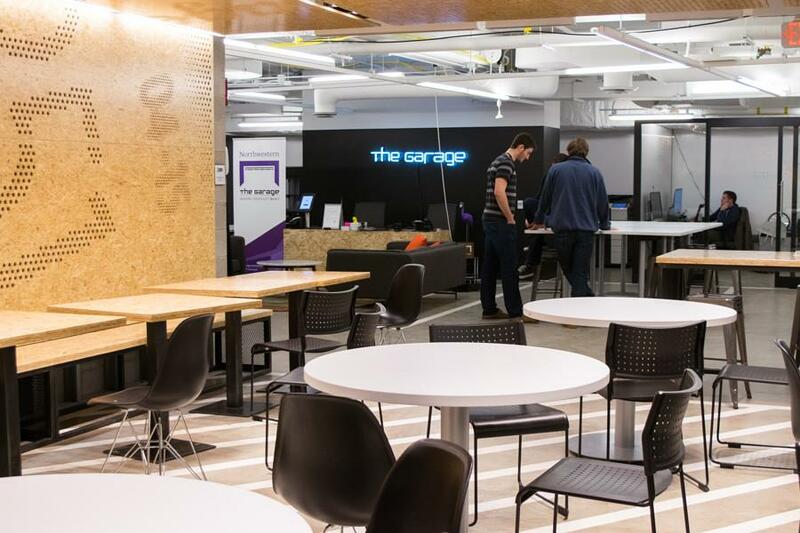 People convene at the cafe of The Garage, Northwestern’s startup innovation hub. The Garage was launched June 2015 as a workspace for student entrepreneurs. Nestled in the second floor of the Henry Crown Sports Pavilion complex, The Garage has begun sheltering late-night brainstorming sessions for what Northwestern students are hoping will be the next big innovation. Prospective groups must apply to gain resident status, which grants them 24-hour access and designated workspace, said Melissa Crounse, executive director of The Garage. The Garage houses 52 student resident teams this quarter, all of which are geared toward projects in entrepreneurship and innovation. Of these groups, 48 are development team “companies” and four are student organizations. Roughly 60 percent are developing software while the other 40 percent are creating hardware. The Garage tags itself a place “where ideas get built,” whether it be a nonprofit, a personal project, an invention or a new kind of service program, Crounse said. Timing and Racing Around the Clock, one of The Garage’s graduated companies, worked in the space during Fall Quarter to develop a software to monitor foot races. TRAC is now in San Francisco participating in Y Combinator, the top accelerator program in the US, Crounse said. Accelerator programs are startup incubators, similar to The Garage, geared toward helping new companies gain traction and take off. “We’re really more of a pre-accelerator which means we’re trying to help you figure out who your customer is, what is your business model, what’s your product, all of that to get you to your next milestone,” Crounse said. For Akshat Thirani, The Garage connected the McCormick senior and his team to people who helped them mold a company model for their product. The group is working to develop Ampér, an energy monitoring and control system for homes. With the help of The Garage, the creators of Ampér have also filed for a provisional patent and have consulted with lawyers. After The Garage, Ampér is slated to participate in HAX, the world’s first and largest hardware accelerator program, in Shenzhen, China. There, the company hopes to set up a manufacturing and supply chain for the product. Another one of The Garage’s residents, Eighty Nine Robotics, launched Tuesday its Indiegogo campaign for Rook, the world’s first fly-anywhere home drone. With Rook, users can control their drones from anywhere in the world. The company’s goal is to reach $20,000 for Rook. As of Monday, Rook has already earned more than $10,000 from a soft launch. For Eighty Nine Robotics, The Garage has served as an invaluable workspace and resource point, said the company’s CEO Jackie Wu (McCormick ‘15). The Garage’s focus on innovation has translated into its physical space. The lab has enhanced its facilities to add a mural, décor, a library and reconfigured workspaces. Last week, The Garage also unveiled a beanbag room to serve as a creative space for students to work in a non-traditional environment. The Garage also allows residents to use tools including 3-D printers, sewing machines, GoPro cameras, Fitbits and Apple Watches in their product development. For teams that reside in The Garage for more than a quarter, their logo stickers are put on the floor by their workspaces as a right of passage. In terms of its space and companies, The Garage will continue to change and develop, Crounse said.